For me, it all started when my parents gave me a Peter Powell Stunt Kite for my tenth birthday. I had never seen anything like it before and was instantly hooked. Two string design and a strong aluminium frame, it could dive bomb and loop-the-loop all day. Intrigued by the possibilities, my father soon started making kites of all shapes and sizes, some so large they needed the aid of a car to just anchor them down. One, made of mylar (a type of untearable aluminium foil), flew wonderfully but it had to go when the police came to check a strange object appearing on local airport radar. Some won awards and one, with a strong but simple self-correcting design, was considered for a radio mast on an antarctic expedition. On the whole, I've loved kites from a young age. 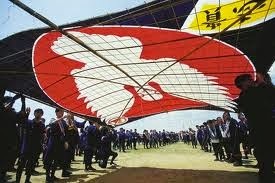 And so, when a Japanese friend told me of the Fighting Kites of Hamamatsu it was an instant must see. Each year, during Golden Week, local teams, all in happi-coats, compete with each other across the great Nakatajima sand dunes of the Enshunada coastline. The kites are beautifully crafted and, up to four meters across, take a team of a dozen or more to fly and control them. 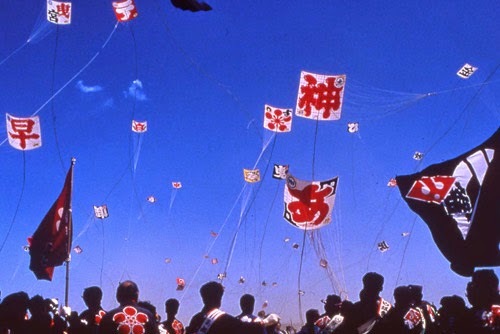 With nearly a hundred in the air, more than a thousand kite warriors bate their breath and wait for the canon roar of fireworks that signal it's time to let the games begin. And the fighting starts. The hemp lines are deliberately crossed as teams run back and forth trying to cut each other's creations out of the sky. The last kite flying, the winner. And the crowds go wild. 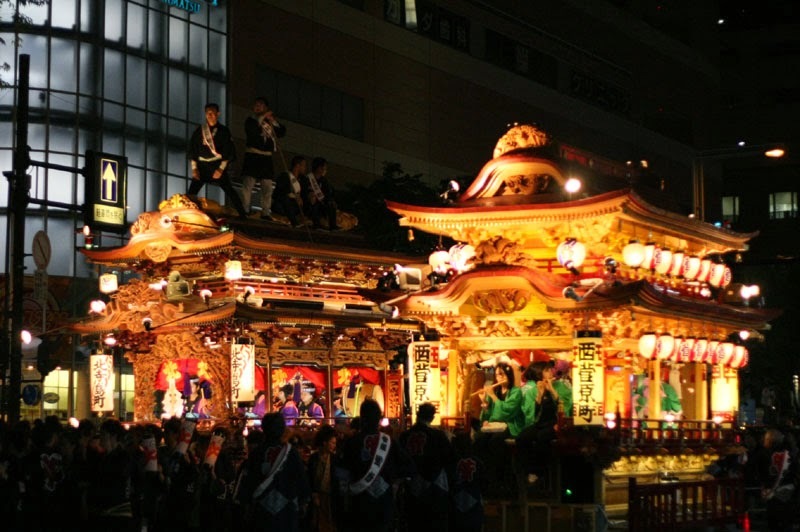 The origins of the festival date back to the sixteenth century when the town's folk celebrated the birth of a son to the Lord of Hamamatsu Castle. And this being Japan, the day doesn't finish there. As thousands make their way back into the city, the niijikai, literally "second party", begins. Giant, ornate floats are hauled through the streets, some more enthusiastically than others as the day's consumption begins to take its toll. Many are carrying drums and flutes and lutes, adding to the general cacophony. And at the end of it all, you finally flop down into your seat for the ninety minute ride back to Tokyo. Happy but exhausted, ears still ringing, all you need to worry about now is, where's that nice lady with the beer trolley.